Our EABCO Threaded 10/22® Accuracy Barrels® have threaded 1/2x28 muzzles to fit Muzzle Brakes and suppressors. 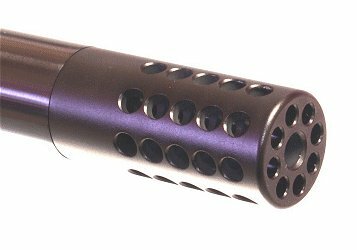 Custom thread protectors are included... Order muzzle brakes separately. Use this barrel installed on your Ruger® 10/22® "as is" with the thread protector screwed on the muzzle or, you can remove the thread protector and screw on a muzzle brake for increased muzzle stability, accuracy potential, and faster follow-up shots (order the brake separately). 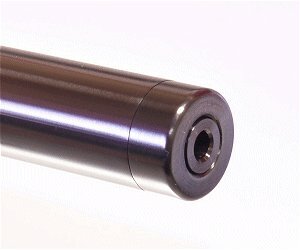 The threaded muzzle is 1/2x28 tpi and the custom thread protector is included. I'm very happy with the accuracy of this barrel; especially considering it cost less than half of what some of the bigger brands cost. After zeroing in my scope, this barrel easily allowed me to shoot, unsupported, less than 1/2 groupings at 50 yds and just using Kentucky windage to adjust for bullet drop I could hold less than 2 groupings at 100 yds. Also, the fit and finish on the barrel was flawless and my muzzle brake fit perfectly on the threads. I couldn't be happier and it's definitely worth the money. Other then being a little heavy I love this bull barrel for my 10/22. It is very actuate. I shot several 3&4 shot rounds and let them all within a one inche circle at 50 yards. Good price and avoid product. You won' t go wrong in buying this barel. Easy to install. Great fit. VERY accurate. I just wish I had purchased one earlier. I bought one of these to put on my custom rabbit gun and it works very well. Right now I have it zeroed at 25 yards and I am capable of getting one inch groups at that range. My buddy and I played with it before we looked for rabbits and we were getting consistent hits on a bottle cap from 75 paces away. Then we got 6 rabbits with it. Rabbit Tacos!